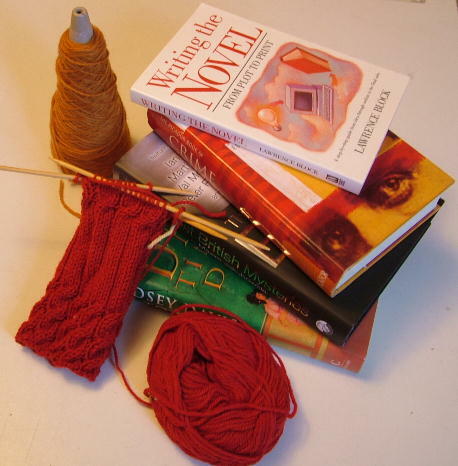 I went to a lovely new knitting group on Saturday afternoon. It's going to meet every 2nd and 4th Saturday in Perry Common Library. That's in Kingstanding, North Birmingham. Next meeting will be on 28th October and it's from 2pm to 3.30pm. They have a lovely community room there with great comfortable chairs for knitting in, and the staff were really nice and friendly and even provided coffee and biscuits. It was a small start as there were only 4 of us, plus the lovely Eileen who works there, but hopefully it will grow. Of course I forgot to take my camera to record the meeting for the blog. Duh! I promise I will take it next time and hopefully we'll have more knitters too. On the book front I'm stil reading Thorn by Vena Cork which is intriguing but not moving very quickly at the moment. hi Pat! glad that I've found your blog! see you on the 11th nov at perry common! I enjoyed Thorn but found the villain's identity disappointing/unbelieveable. Look forward to reading what you make of it.